to improve hearing and enhance their quality of life. 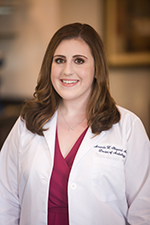 Dr. Amanda Shepard earned her Doctorate of Audiology from the University of Pittsburgh. She completed her clinical fellowship at the Children’s Hospital of Pittsburgh, one of the leading pediatric facilities in the country. Dr. Shepard is a fellow of the American Academy of Audiology and attends the organization’s conferences to stay up to date on the latest research and technology. She is also a member of the American Speech-Language-Hearing Association (ASHA) and holds a Certificate of Clinical Competence in Audiology. She received her Bachelor of Arts in Speech, Language, and Hearing Sciences with a double major in Spanish Language from the University of Connecticut (Go Huskies!). Having grown up in Wilton, Dr. Shepard is beyond thrilled to be back in Connecticut and to work with Dr. Weiss and his distinguished practice. Dr. Shepard is committed to helping all patients with hearing loss achieve better hearing and improve their quality of life. She feels that improving the hearing of others and helping them reconnect with their family and friends is the most rewarding part of what she does. Dr. Shepard loves spending time with her family, friends, and dog, and enjoys traveling, cooking, exercising, and theatre.